Many Americans think of Japanese gardens in terms of either the famed gardens of Kyoto or display gardens in parks or botanic gardens here in the United States. But in Japan, small residential gardens are also beloved and ubiquitous, especially in dense urban areas. 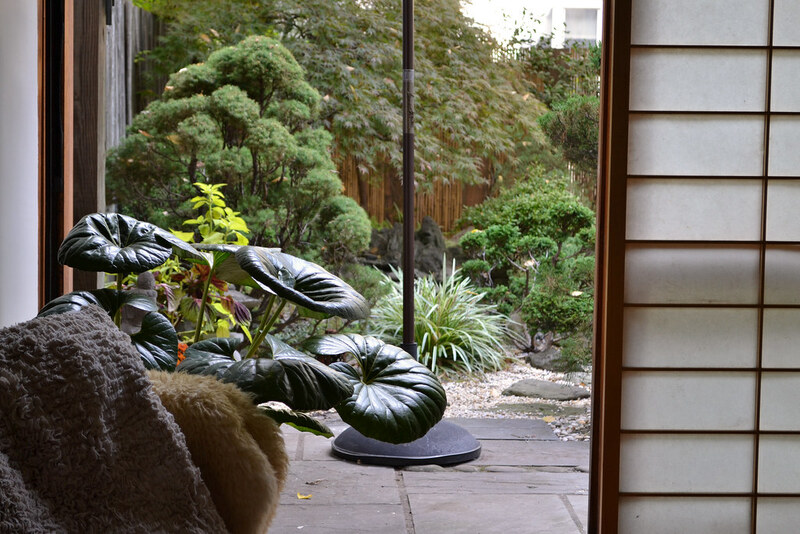 One common style, the tsuboniwa, is an internal courtyard garden that first came into vogue in the 1600s. These gardens were a way for middle-class city dwellers, inspired by large estate gardens, to bring a bit of nature into their own homes. Tsuboniwa are still popular today, as are pocket gardens in other tiny spaces adjacent to the home. 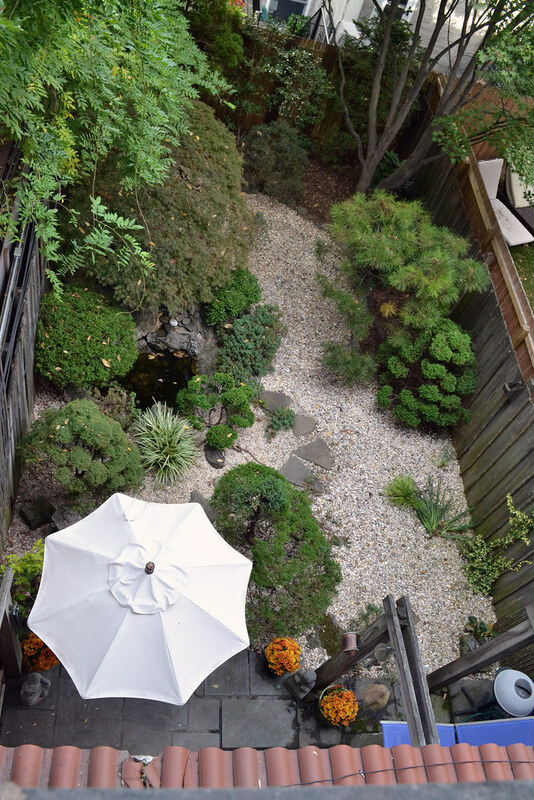 Many small spaces in Brooklyn and other cities are very well suited for similar gardens. 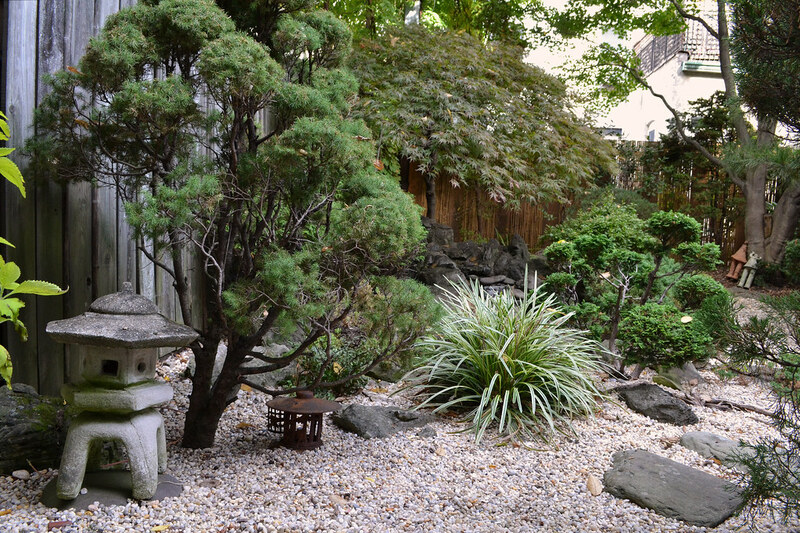 Just look at this lovely small Park Slope Japanese-style backyard garden. When the garden's owner, Roberta Samet, bought her classic Brooklyn brownstone in 1985, the 20- by 40-foot backyard was filled with construction debris and badly in need of a cleanup and overhaul. “That gave me carte blanche to create whatever I wanted,” she says. 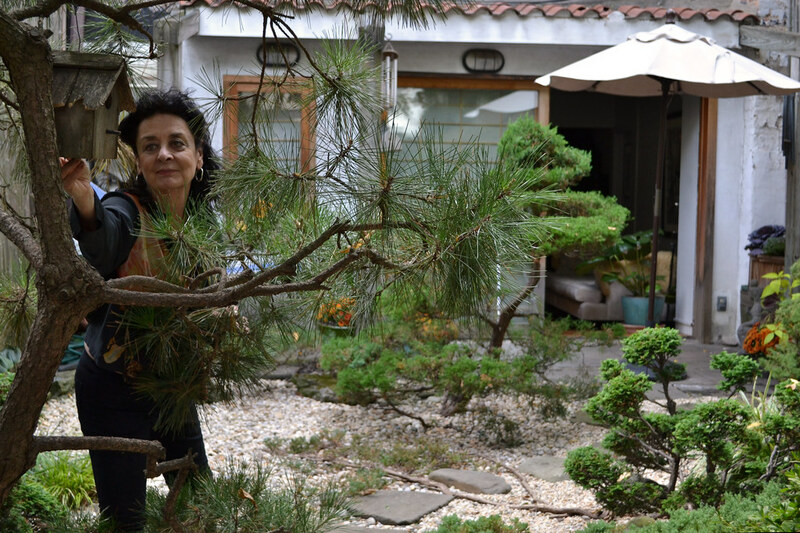 Samet had always admired the Japanese aesthetic and particularly loved the idea of having an evergreen garden. 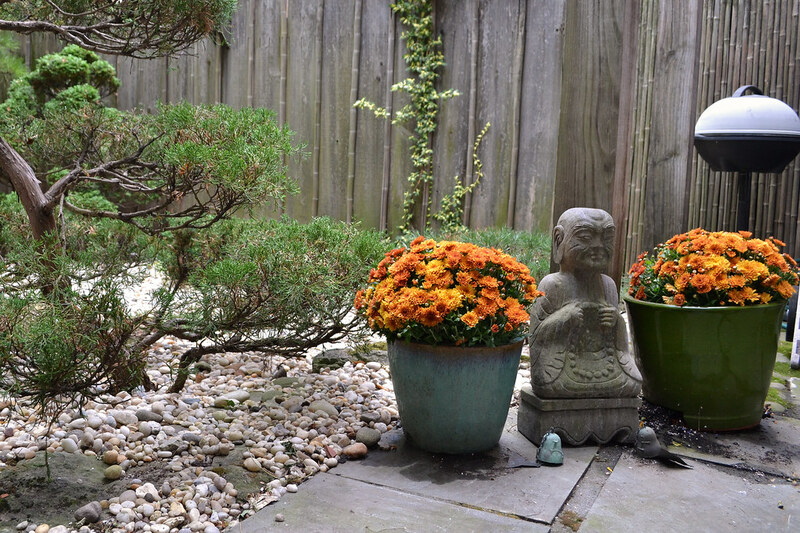 Samet hired landscape architect Gil Rosenthal (of Japanese Gardens by Gil Rosenthal, in Nassau County) to design and install the garden. He created an asymmetrical layout with a steppingstone path, a small pond and waterfall, and naturalistic plantings dominated by conifers like Sawara cypress and white pine, as well as Japanese maples. The combined effect is very much in keeping with one of the key tenets of traditional Japanese gardens—to create a scene inspired by the natural world, but on smaller scale. “It’s a classic style that can be easily maintained for many years,” says Rosenthal. 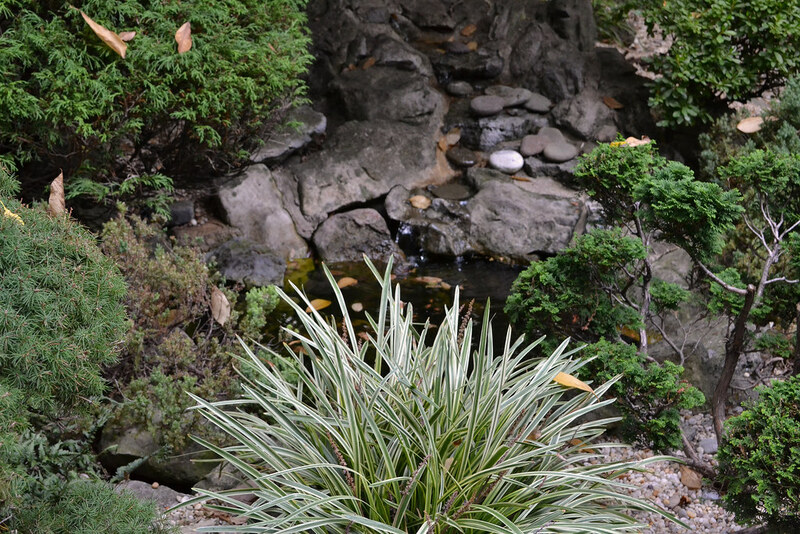 In the Japanese tradition, stone and water are more prominent than in European and American gardens. Rocks—“the bones of the earth”—provide structure in a Japanese garden, while water represents renewal. Samet’s small pond and waterfall, below, incorporate both, and also broaden the sensory experience by creating pleasing natural sounds that help insulate the garden from the noise of the city. The azalea shrub at the back of the waterfall, for instance, provides bright pink blossoms in the spring and shiny evergreen foliage year-round. The two maples offer lovely greenery and shade in the summer and turn deep shapes of crimson in late fall. “The evergreens all look magical in the winter covered in snow,” says Samet. This planting scheme, combined with the large expanse of gravel, makes for a very low-maintenance space, says Samet. “I always say it’s not a garden for people who like to garden.” Weeding is minimal, particularly because the site is relatively isolated from any weed-bearing lawns or parks, and most of the tending she does involves watering and simple cleanup. A thorough, professional pruning once a year is a must, though. Each summer, a pruner from Rosenthal’s firm gives the garden a thorough “haircut.” This has allowed the original plantings to develop a natural-looking windswept form over the past 30 years. Residential gardens in Japan are often enclosed by a fence so that the doors to the home can open onto the garden while still allowing a sense of privacy. To this end, Samet had sliding glass doors and paper shoji screens installed so that her living room could look right onto the garden. “I feel like I’m in the garden even when I’m inside,” she says. The garden is also an enjoyable place to spend time in. Samet's small stone patio has space for seating and a grill and is adorned with potted mums and a small statue of the Asian goddess Guanyin. In the summer, she also grows herbs in the space. Samet has included a mix of Eastern and Western ornaments in the garden. 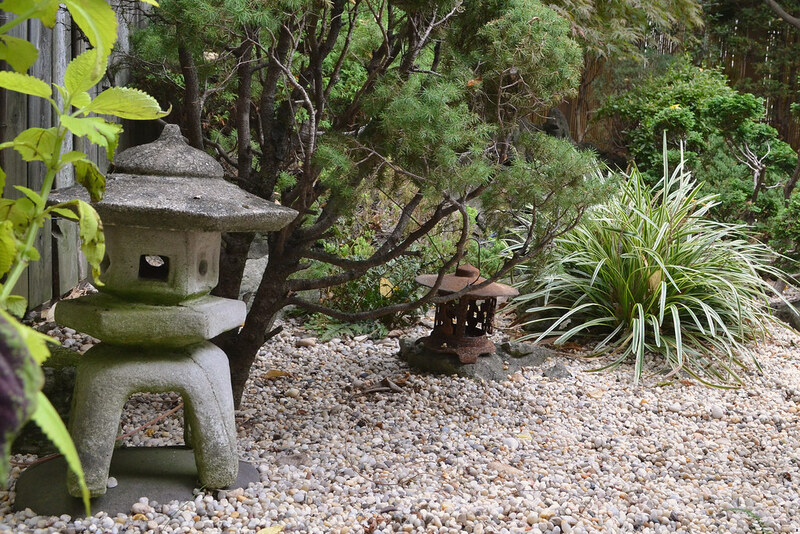 A traditional Japanese stone lantern sits beside a handmade metal one that was a gift from her sister. When she lights candles in both on warm summer evenings, her serene retreat seems miles away from the hubbub of city life. 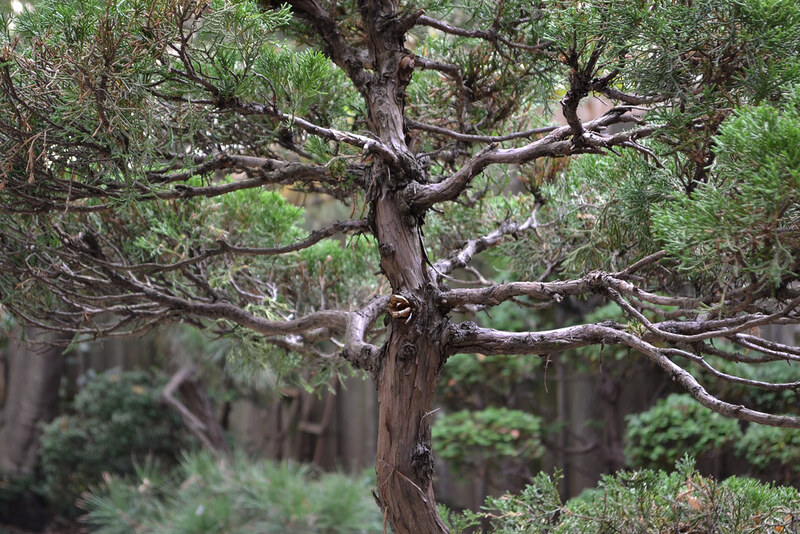 The Japanese Garden Database provides listings for local garden designers who specialize in Japanese-style gardens. For more information on establishing a Japanese-style home garden, see BBG's handbook Japanese Style Gardens. Actually, the pictured garden statue is of the Bodhisattva Jizo, not Guanyin. This is a very popular Japanese divinity, who is the savior of pregnant women and children generally, among others.